As I mentioned in a previous post, as a kid I was a big fan of Joe Dever's Lone Wolf Adventure Gamebooks. 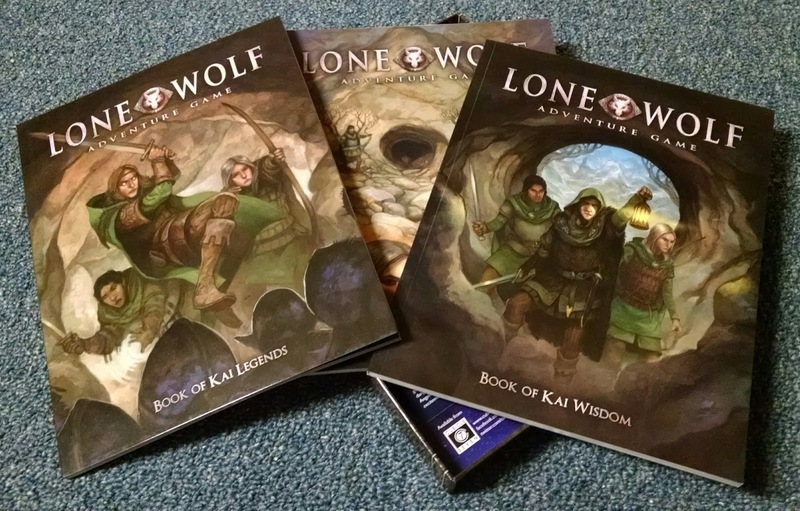 So it was with eager anticipation that I received my boxed copy of the Lone Wolf Adventure Game. 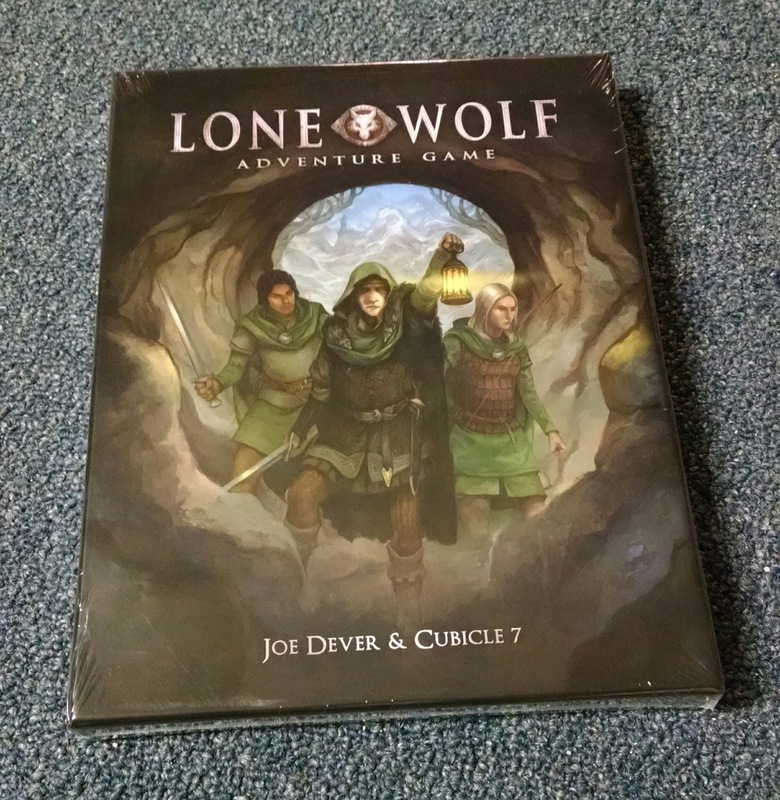 The box came wrapped in shrink wrap, and after posing it for a quick photo or two, I tore into it. 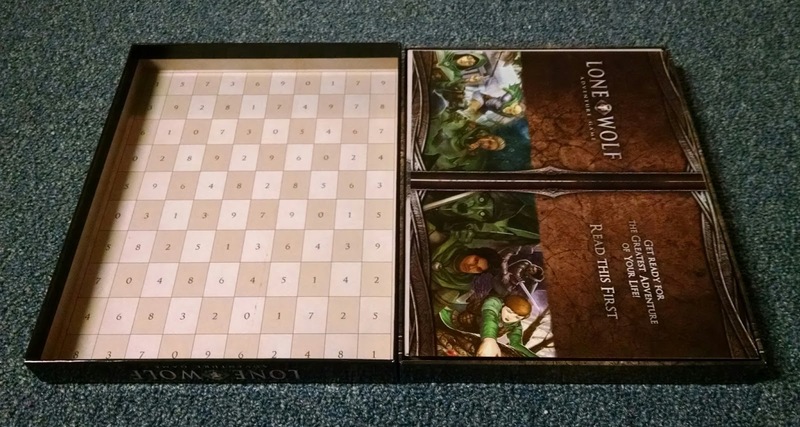 The inside of the box top (and, it turns out, the bottom too) serves as a Random Number Table, similar to the ones found in the backs of all the Lone Wolf gamebooks. 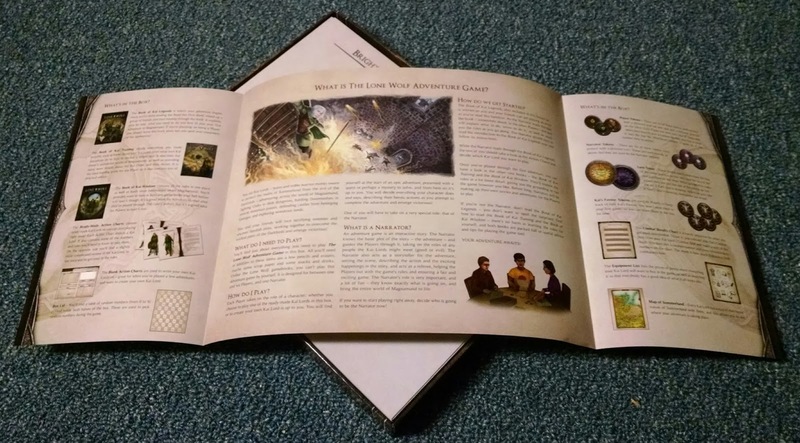 It serves as a decent substitute should you be without any dice. 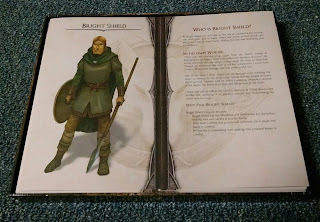 Inside is a quick start "read me first" handout, along with several "Action Charts" (the Lone Wolf equivalent of "Character Sheet") for six pre-generated characters that come with the game. Four are male, and two are female. 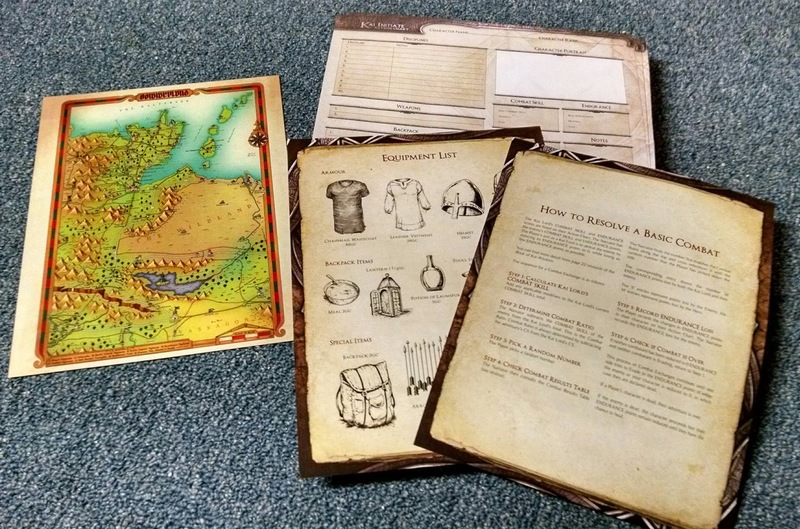 The Action Charts are reversible, with one side containing the chart for the "Initiate-level" game, and the other containing the "Master-level" chart. 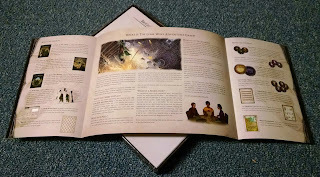 The flaps contain character artwork and additional background information. 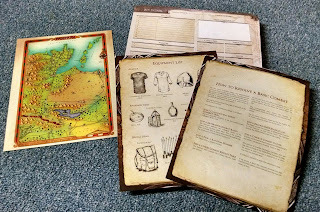 There are also some handouts that includes a double-sided map of Sommerlund and surrounding lands, some reference sheets, and blank Action Charts. 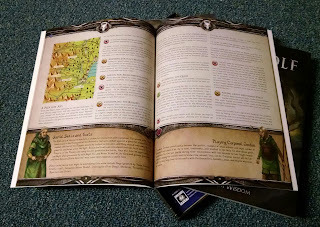 While the Action Charts would work great for their intended purpose, since they are on such nice paper, it almost seems a shame to use them, so I will likely use photocopied versions instead. 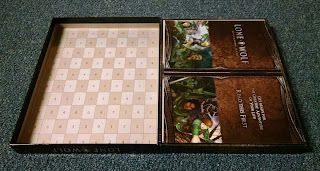 There is a sheet of counters that can be used for "Luck tests", which amount to flipping a coin, and also for using the Random Number Tables that make up the insides of the box covers. 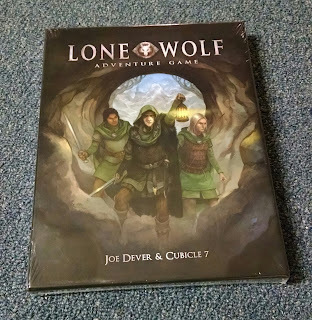 I will likely be using dice for my games, but I may use these occasionally for novelty's sake. In conclusion you get a lot for your $30. 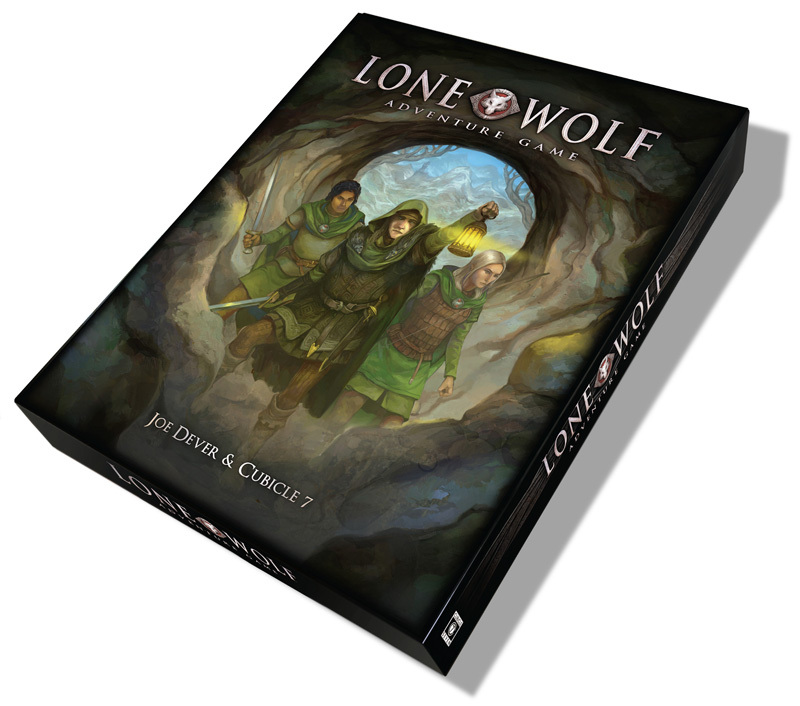 Production values for RPGs have certainly gone up in recent years, and the Lone Wolf Adventure Game is no exception. 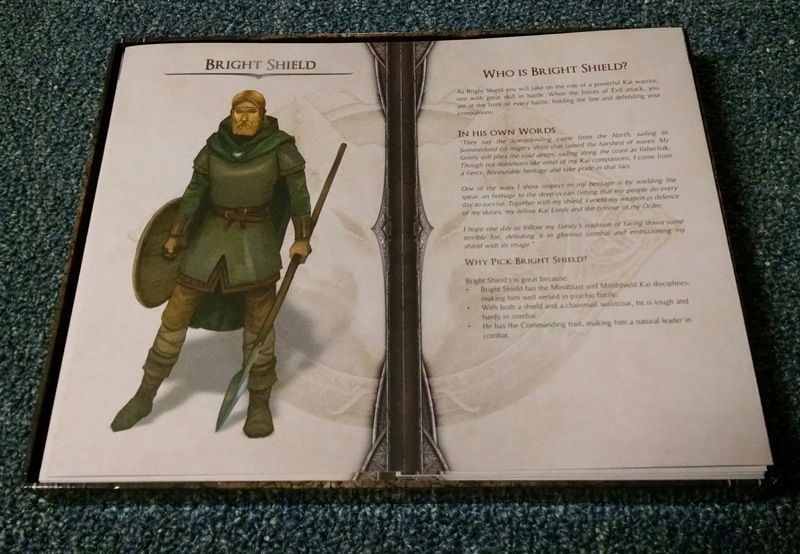 I look forward to the supplements to the game that are due out next year. I also plan to try out the system with my children soon, and once I do I will post a recap of that here.